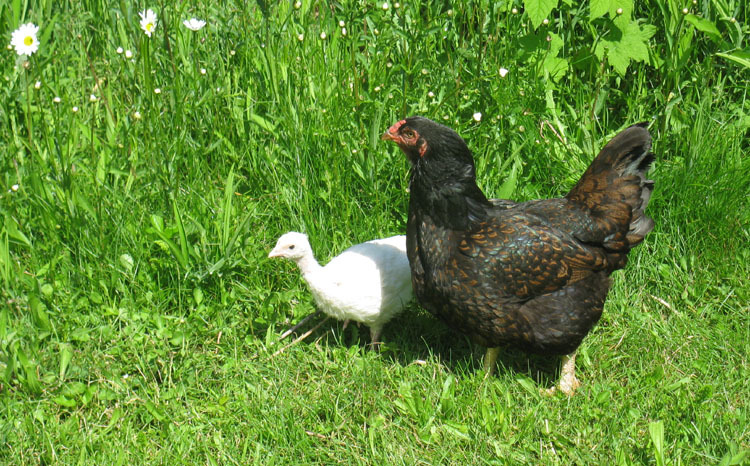 Ebony and ivory: Dark Cornish hen, surrogate mom to a White Midget turkey. If you missed the Mother Earth News Fair in Puyallup last weekend, I sure hope you have a good excuse! Seriously, though, what an amazing event to enjoy and participate in. Thanks so much to all of you who came to hear my presentation on raising turkeys; this was a new experience for me, and you helped make it a surprisingly easy debut. I appreciate your kind feedback, as well as your questions. I had a lot of fun and learned some things myself. I'd also like, once again, to thank Mother Earth News, the American Livestock Breeds Conservancy, Storey Publishing and all the other sponsors of the Fair. You all put on a terrific event, and I truly feel privileged to have been part of it. Speaking of questions, I realized after I left the Fair on Sunday that I had failed to answer a question from a gentleman who attended my talk that day. He asked two questions, and I'm pretty sure I only answered the first one (blush). The question was, do we have to round up the turkeys or herd them into their roost area at night? In general, we don't; like most of the other birds, once it's starting to get dark, they all head for their respective coops and roosts. The only real exceptions are 1) when we're trying to close them up early because we're going out that evening; and 2) when the birds are young or are being moved from one coop to another, it usually takes a few days for everyone to get used to the new location. However, although they will all put themselves to bed if we just wait long enough, our oldest White Midget tom always hangs back for a while; he really likes one of us to walk him down to the roost. The ducks also tend to wait around for us to walk them in. The chickens are all very good about going to roost; they're usually in a good hour before it gets dark, and all we have to do is close the coop doors. Several of you asked me about buying hatching eggs or young Midget White turks from us. As three of our four breeding hens were killed this spring, for this season anyway, we won't have any eggs or turks to sell. If you'd like to be on the list for when eggs or young birds are available, feel free to contact me and let me know. We managed to rescue some partially-incubated eggs from one of the turkey hens that was killed, and put them under a broody Dark Cornish hen. She hatched four turks, but unfortunately three of them didn't make it. Our one remaining baby is about four weeks old now and growing really well (see photo above); we're pretty sure it is a female, which is good news. If you're interested in raising turkeys, but need more information, a good resource is the American Livestock Breeds Conservancy. They have very good materials available from their web site, and can also be contacted by telephone or e-mail with your questions. For detailed information about the different turkey breeds, you can't do much better than get a copy of Carol Ekarius' book, "Storey's Illustrated Guide to Poultry Breeds." It is a beautiful book with amazing color photos, as well as excellent information on many kinds of poultry. In my opinion, this is a book that should be on every poultry enthusiast's bookshelf, and well worth reading. I was fortunate enough to meet Carol at the Fair, as well as several people from Storey Publishing, and I encourage you to check out Storey's complete booklist; they offer an impressive selection of titles covering just about any sustainable-living topic you can think of. Again, if you couldn't make it to the Mother Earth News Fair last weekend, please do try to attend one of the two additional fairs later this year. Check the Mother Earth News web site for more information. great pics..nice artical publishing by you...appreciate on you...thanks for giving detail.. Thanks for the kind words! I'm glad you're enjoying the blog.